It turns out that Dr. Grordbort's Invaders is not the only Magic Leap demo to become a reality for the Magic Leap One. ILMxLAB, the augmented and virtual reality arm of Lucasfilm, announced on Monday the Star Wars: Project Porg for Magic Leap One. The team didn't disclose when the app will be available for download on the ML1, but the experimental demo will debut at the L.E.A.P. Conference, with Vicki Dobbs Beck, executive in charge of ILMxLAB, unveiling the experience during the keynote on Oct. 10. According to the announcement from ILMxLAB, Project Porg calls for players to raise their furry friends by feeding them and teaching them to move on and around real-world objects. C3PO also guides players in their tasks of fostering their porgs. On Friday, Magic Leap confirmed that Dr. Grordbort's Invaders, the long-awaited first-person shooter from Weta Workshop, would launch at the L.E.A.P. Conference. The first glimpses we got of the Dr. Grordbort game's existence was the original demo video from Magic Leap. Like Weta, ILMxLAB was also an early content partner for Magic Leap. 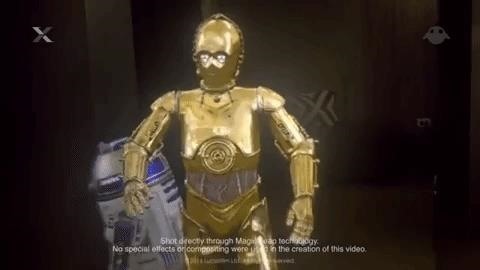 In 2016, the team produced a demo video starring virtual C3PO and his droid life partner, R2D2. For the moment, though C3PO appears to be the only common thread between the demo and Project Porg. 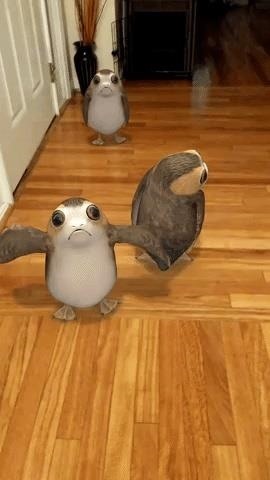 The Project Porg game isn't the first time that the loveable (or loathable) porgs have appeared in augmented reality. And it is unlikely to be the last time, either, as there have been a murder of porg experiences through mobile AR apps. The porgs were first found in augmented reality last year through the Find the Force scavenger hunt promoting the launch of merchandise for Star Wars: The Last Jedi, where the porgs made their silver screen debut. Snapchat hosted the pug-penguin hybrid in a World Lens in a promotion for Star Wars: The Last Jedi. Google also included porgs in the Star Wars sticker pack for its AR Stickers app, available exclusively on Google Pixel handsets. The creatures also made their way into Star Wars: Jedi Challenges via an update earlier this year. 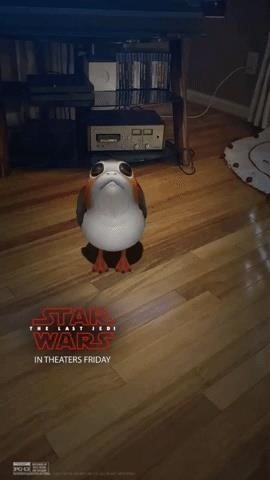 Frankly, based on the frequency by which porgs show up in AR, it shouldn't be a huge surprise that they are the centerpiece of the first Star Wars AR app for Magic Leap. In addition to debuting the augmented reality experience, ILMxLAB visual effects guru Michael Koperwas will present his experiences in augmented reality storytelling on Oct. 10 from the keynote stage.